"A low-carb take on ravioli. 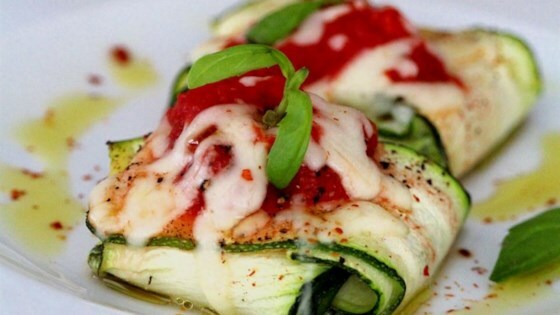 Thin strips of zucchini are stuffed with a classic magro (lean) filling and pesto, topped with tomato sauce and cheese, then baked. Top with fresh hot chile peppers or pepper flakes and more Parmesan cheese." Never miss the pasta with zesty zucchini packets! Toast the pine nuts if desired. I microwaved the zucchini first to soften it otherwise followed the recipe.